Ashraf Ramelah discusses Egyptian President Abdel Fatah Al-Sisi’s recent appointment of two Coptic governors, his possible motives for doing so, and how the appointments fit into the larger picture of Islamic politics in Egypt. In Egypt, the president appoints the governors of the country’s provinces. This practice began with President Nasser after the end of the kings’ era. Last month President Al-Sisi appointed two Christian governors to two principally Christian provinces — the highest concentration of Christians in all of rural Egypt — located in Upper Egypt and West Egypt. This is monumental in a country where Islamic sectarianism dictates politics. When Al-Sisi took office in 2013 for a four-year term, he immediately appointed new governors, all Muslim, for each of the 27 provinces, as did his predecessors — Mubarak, Sadat, and Nasser. Now in the beginning of his second term, Al-Sisi replaced two of his original governors at the end of their six-year terms with two Christians — the first time in modern history that some all-Christian towns would have a Christian administration. However, there was one earlier unsuccessful attempt at this by Egypt’s military interim government (SCAF) in 2012 after Mubarak was ousted. With Al-Sisi’s recent appointments, it looks as if the president has a high regard for the pre-Nasser era. However, when all of the current governmental actions or inactions are taken into account an accurate and truer picture comes to light. Does this picture show improvement for human rights and liberty inclusive of the Coptic minority community, or are things getting worse? Some Egyptians say there is now a new democratic president who is enforcing the law and standing against religious discrimination. They will emphasize the president’s visiting the Coptic Orthodox Church on Christmas and building a Coptic Cathedral in the new administrative city of Cairo! He pressured the parliament to issue a fairer law regulating church construction. Meanwhile, has it occurred to any of the enamored why church construction is singled out for draconian enforcement while most of the country is allowed to navigate illegally? It was certainly extraordinary for the president to appoint two Christian Coptic governors to these particular regions when you consider his record: a long span of unchecked violence against Copts, Coptic-victim persecution through archaic “arbitration” courts, forced evacuation from homes and villages of Coptic victims of brutality, and murders of Christians uninvestigated and unprosecuted. Under Al-Sisi’s watchful silence the prejudicial permit requirements remain in place against church construction, oppressive use of permits target Christians who pray inside their own homes, unenforced laws regarding regulated and permitted city and town services while selectively exacting on trivial matters within the Christian community, Orthodox churches destroyed by terror elements inside the state without government aid to rebuild, local police cooperation with sectarian terrorists inside villages against Coptic residents, and many churches that have been forced to shut down and remain uninhabitable. Nominating Coptic Christians along with planned Islamist protests would offer Al-Sisi the chance to dismiss the Coptic governors he just appointed for the sake of “peace”. Actually, he could either withdraw the appointees or stand firm with them to prove his power over terror elements, mainly to the West. Of course, if no Islamist protests are pre-planned by the government but a spontaneous one erupts — after all, Islamic law mandates that a non-Muslim will not have authority over a Muslim — the outcome either way benefits Al-Sisi’s image. His government is then separated from the terror elements that are continually permitted to get away with murder. This is nothing new. In 2012 after the ouster of Mubarak, the military interim government (SCAF) chose Imad Shehata, a Copt, for governor of Qena Province. Egyptian Salafists and Muslim Brotherhood held noisy demonstrations against Shehata, cutting off the train line that runs through the province and threatening to kill the designated governor if he accepted the nomination. The SCAF surrendered to Islamist demands. Bringing these facts to light and reflecting on the deeper issues is the only way to begin to understand the true nature of the difficulties in Egypt. It is especially apparent that no solutions are emerging from the political elite, who accomplish very little while manipulating the people to maintain the status quo or incite a worse situation. Dr. Ashraf Ramelah is founder and president of Voice of the Copts, a human rights organization, and a board member of Stop Islamization of Nations (SION). For his previous articles, see the Ashraf Ramelah Archives. This entry was posted in Arab Spring, Civil Liberties, Counterjihad, Domestic terrorism, Legal action, News, North Africa, Politics, Religion, Religious persecution, Sharia by Baron Bodissey. Bookmark the permalink. I don’t have information on the situation, other than the article above, but the parallels with Trump in the US seem striking to me. Trump comes in as a reformist President, but delays implementing some of his major promises, like building a wall, for two years and counting. One explanation is that he was just saying what he needed to to get elected, as a showman, without any real conviction. Another explanation is that he has been wrestling with the complexity of the Washington milieu and with actually bringing the electorate with him. With dramatic videos of the Central American, Mexican caravan heading towards us, the electorate still puts healthcare (lower medical costs) as the first priority. So, according to this explanation, Trump had to get his feet planted firmly and only institute the wall at the right time. The dual possibilities for al-Sissi make me think very much of Trump. 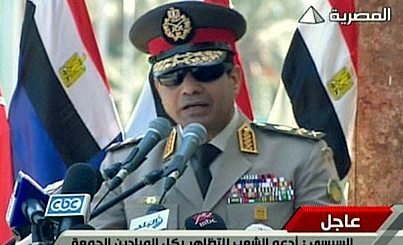 It may be showmanship, or then again, it may be the actions of a military, non-elected President who feels more ready to take on the Muslim Brotherhood and Islamist fanatics so influential in Egypt. “Mr. Sisi is taking steps no Egyptian president has taken before. However, his efforts are colliding with reactionary forces and parts of the state apparatus which operate in the old way. I can say that Mr. Sisi has made a lot of changes, both publicly and behind the scenes, there are policies to taming the deep state, including those with extremist tendencies. He has recently made a lot of changes in the security apparatus and there are many new faces that have loyalty toward him. The importance of the decision is that he (the president) appointed two Christians in provinces that do not have a large percentage of Christians. Also, Dakahlia governorate is one of the largest provinces in Egypt, most importantly he broke the fear of the Islamists and appointed a Christian woman who was a deputy governor of Giza and proved successful in her previous position, where she made extensive efforts in the fight against slums and development. It is not surprising that the Egyptian military interim government (SCAF) surrendered to Islamist demands by withdrawing the Copt governor they had chosen. Al-Sisi is another story entirely. So, let’s see what happens. Personally I feel that RonaldB’s second possibility hits the nail right on the head. MP Ghada Agamy, a Member of Parliament and of the Foreign Relations Committee of the House of Representatives, says there’s nothing positive when it comes to the Niqab. She stated her opinion that the government in Egypt should ban women from wearing a full-face veil in the governmental workplace. Well, it’s a first step, no? You go Egypt. an Egyptian Copt here, it is positive but not Enough, we’re not just a minority, we’re the biggest christian community in the whole ME-NA area, the country had just 5 to 6 millions pre WWI, 40% of them Copts, fourty after 1350 years of massacres and cultural invasion, the actual radical change came with modernity, muslim brotherhood establishment, enhanced medical care, and a real plan by Saudis (unified country since 1932) to sweap the whole region with their ideas and extreme sort of dogma, it is happening exactly as the way the muslims behave in European Judeo-Christian and secular countries, Outnumbering and invasion through the wombs, if they were able to succeed in the past where people had stronger faith and solid identity principles, wouldn’t they do it again when chances are perfect?! You are sadly correct. When I think of how things will go, I remember Egypt, once the breadbasket of the Mediterranean.